At Complete Learning Solutions, we like to make a difference in New Zealand and around the world. 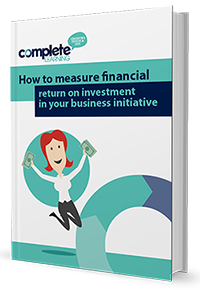 Download our FREE ROI e-book! Download our FREE e-booklet for valuable tools and advice on measuring training effectiveness and financial return using the Phillips ROI Methodology™. Congratulations, your FREE e-book is on it's way to your inbox! Is it learning in the workflow? Only questions that L&D people ask. Just HELP people do their jobs better! Stay informed about organisational learning and development trends from all over the world, with articles and news delivered straight to your inbox!